D.A.R.E. - Drug Abuse Resistance Education - is one of the most important programs at the Sheriff's Office as it directly involves the lives of our children. Working with police departments in Middlefield, South Russell, and Chardon, D.A.R.E. officers provide training to all students in our county. The D.A.R.E. Program was piloted by the Geauga County Sheriff's Office in 1989. The first officer to be trained and certified by D.A.R.E. Ohio was Deputy Mark Bertone. Mark was one of the first of 30 D.A.R.E. Officers to be certified in the State of Ohio. 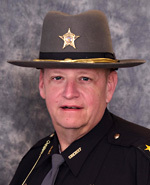 Deputy Bertone retired from the Geauga County Sheriff's Office in June of 2004. The program was well received, and soon, more schools were requesting the program than Mark could accommodate. In 1990, the Geauga County Sheriff's Office sought to place another deputy in the D.A.R.E. Unit, and sent Deputy Juanita Vetter to the Ohio Peace Officer's Training Academy for D.A.R.E. Officer Training. Once certified, Deputy Vetter immediately aided in expanding the program throughout Geauga County. By 1992, those elementary schools that did not yet have the D.A.R.E. Program were anxious to get on board. In response to these requests, Deputy Joe Keough was added to the D.A.R.E. Unit. As a result, by the second semester of the 1992/1993 school year, all seventeen of the public and catholic parochial elementary schools within Geauga County had their own D.A.R.E. Program. The 1993/1994 school year proved to be a ground breaking one for the Sheriff's Office and it's D.A.R.E. Program. Not only were several junior high programs piloted, but also the first Amish Parochial school programs were piloted. In response to requests from the Amish Community, a Parent's Night Program was held in the gymnasium at Cardinal High School, where the D.A.R.E. Program was reviewed for several hundred Amish parents. As a result, the first Amish D.A.R.E. Programs were initiated that year in four Amish parochial schools. The program has steadily expanded each year and currently, 24 Amish parochial schools participate. These were the first, and to this date, the only Amish Parochial schools in the United States that participate in the D.A.R.E. Program. As a result of our commitment to the D.A.R.E. Program, 4,400 students participated in the D.A.R.E. Program during the 2000/2001 school year. Deputy Roy Lundstrom teaching a DARE class.